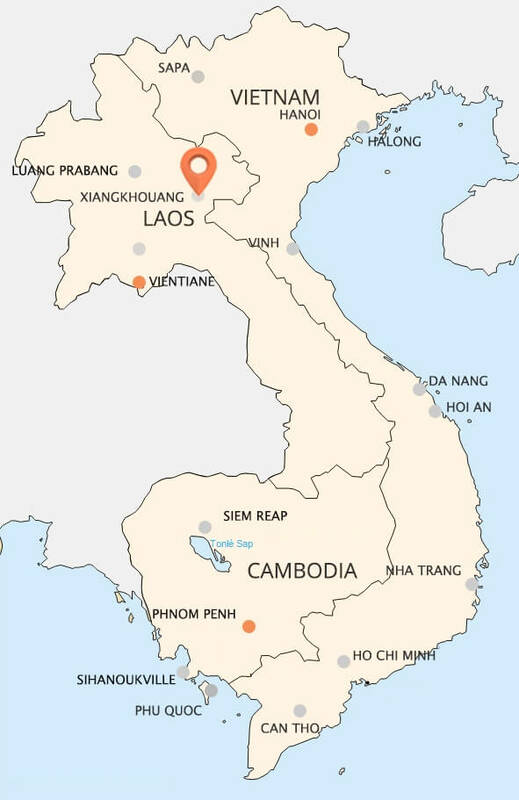 Xieng Khouang is a province of Laos, borders with Nghe An province of Vietnam to the east and with Vientiane to the south. Xieng Khouang is a relatively large plateau. This plateau is located at an altitude of 1,500 - 2,000m, has cool climate all year round. This place has a strange peaceful beauty. If visitors know its history, they will be very astonished by the optimism of people here. During Indochina war against US imperialism, Xieng Khouang is one of the provinces which suffered a huge amount of bombs attacked. After the liberation this province is victim of hoodlums. 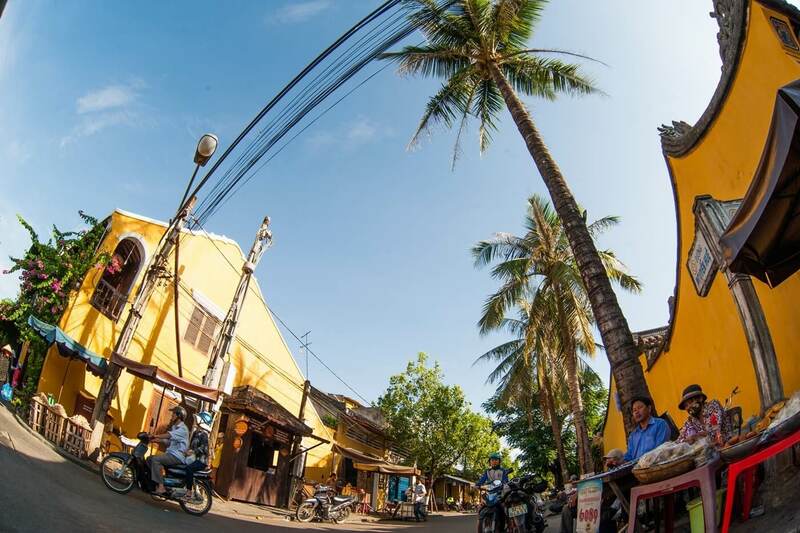 Despite of many difficulties and hardships, Xieng Khouang today is growing rapidly, especially tourism. 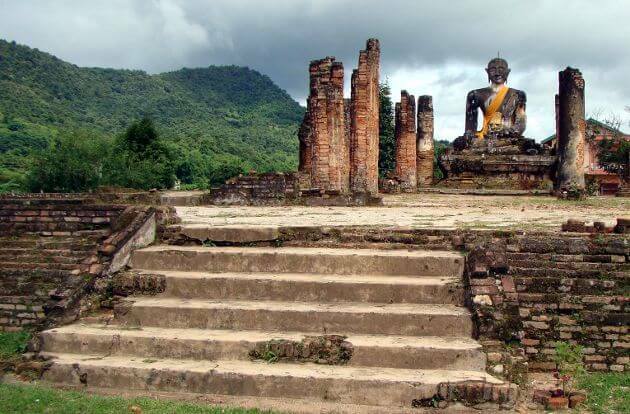 From Luang Prabang to Xieng Khouang, visitors must travel on Road 13, also known as RoyalRoad. On this road, visitors can contemplate peaceful landscape of this plateau. The rolling hills are covered lush green smooth grass, adorned with ravishing natural pine forest. The slender wooden fence runs interlayer romantic hills make this land as suburban famous cities of Europe. Far away, each pair of horses leisurely grazes under the pine trees. 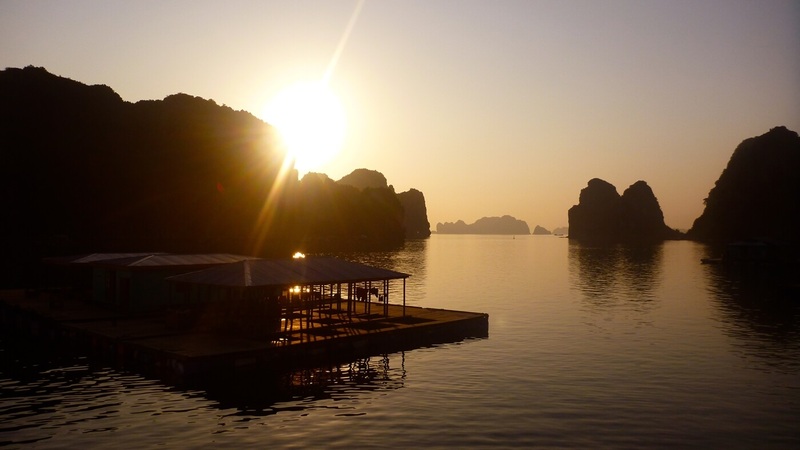 For any visitors, this place is really ideal to relax and having unforgettable moments. 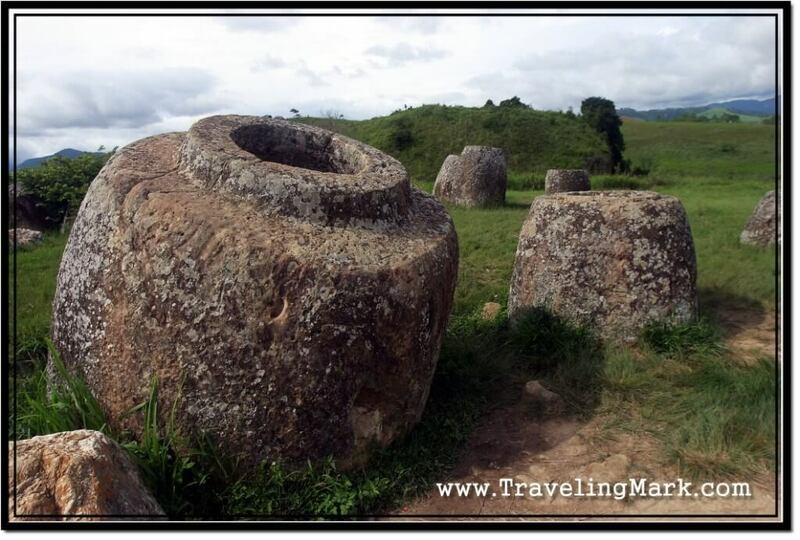 The Plain of Jars is a cultural and historical area, near Phonsavan town of Xieng Khouang province, Laos. This is a place where there are thousands of stone jars scattered along the plains of Xieng Khouang Plateau at the northern of the end of Truong Son mountain range. So far, it remains a challenge to international archaeologists. It is unclear that who made these jars, how they made them and why these jars just only lied in Xieng Khouang. The whole Plain of Jars has thousands of different jars scattered in around 52 points in Xieng Khouang. The biggest jar was found having 2.5 meters in diameter and weighing up to tens of tons. The rest are diverse in shapes, sizes, totally different with each other. Most of them do not have the cap and was arranged follow no natural rule. Seen from afar, Plain of Jars looks like a chessboard and the the jars look like intricacy chess pieces. According to legend, there was a king named Khun Chuong, after winning a battle against the enemy, ordered to erect the Plain of Jars and used them for making wine for his soldiers. Despite of being an attractive destination, The Plain of Jars is still one of the archaeological sites, the most dangerous in the world today. 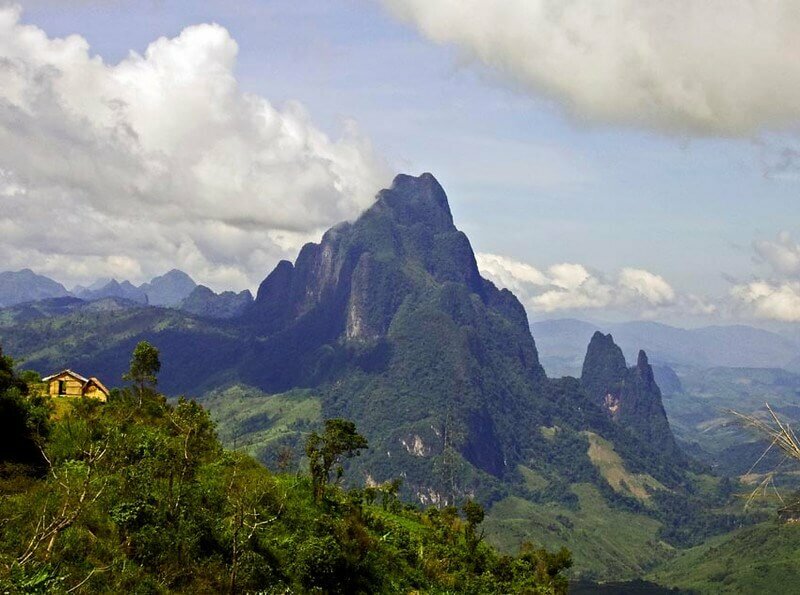 Phou Bia Mountain is the greatest mountain in Laos and located on Truong Son Mountain range, at the southern limit of the Xieng Khouang Plateau, Xieng Khouang province. 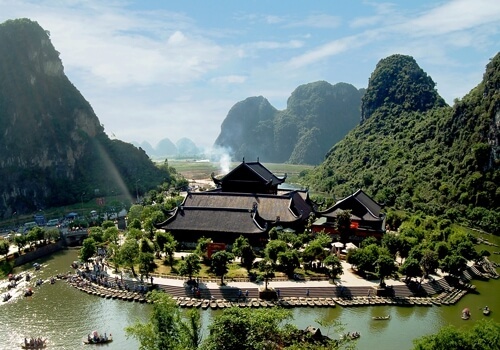 Due to its high altitudes, this mountain has cold and chilly climate and almost be shrouded by haze. The mountain is covered by a vast green of the tropical jungle. The ecosystems of forest here characterize for western Truong Son’s climate. In particular, it also retains primitive features that having not been explored to develop tourism, very suitable for those who have passion for adventure and discovery. Phou Bia Mountain is a fairly secluded area, few people live here, the number of tourists coming to this place is also not much. This is the result of the Indochina war. Due to the difficult terrain and dense forests, this mountain was used by H'Mong as the focus of Laotian guerrilla. In 1970, the number of guerrillas here has grown to more than 60,000 soldiers. In many battles, Vietnam army brought troops in here. There are reports that, until 2006, it still has one small group of H’Mong people hiding here. Due to remain many unexploded landmines, and also have a limited abandoned military area, it would be difficult for visitors to discover this majestic mountain.